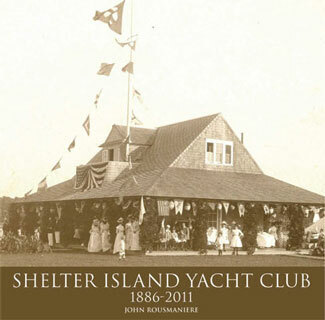 From the Gilded Age to modern times, here is the rich and colorful 125 year history of the Shelter Island Yacht Club, as told by nautical writer and sailor, John Rousmaniere. Founded in 1886 at the entrance to Dering Harbor – one of the finest deep-water small harbors on either coast of the American Continent – the Shelter Island Yacht Club became a favorite stopping-off point for grand steam and sailing yachts from New York and Brooklyn. One visiting yachtsman heralded the harbor as “the snuggest little cubby hole that ever was.” It was so desirable as a summer sailing resort that in 1892 the New York Yacht Club designated Dering Harbor one of its outposts for its cruising members, and by the turn of the century, it could claim 21 steam yachts 79 feet or longer, with the queen of the fleet at 211 feet, the Hauoli, owned by the “Borax King” Francis Smith. In those early days, balls and dinner dances were the happy occasion for women to appear in their white gowns and finery. But even more popular were the sailboat races, which were the club’s main interest. Over the past 125 years, the club has had more than a dozen one-design classes., as well as cutting-edge sailing yachts of all sizes designed by the brilliant Nathanial Herreshoff, “the Wizard of Bristol.” That tradition continues to this day. The club now boasts active fleets of Etchells, Optimists, and 420s, as well as the largest fleet of 1914-designed Herreshoff 12 ½ s in the nation, with more than 55 boats. With its membership larger than ever, SIYC continues to thrive, a happy blend of tradition and modern, a place of camaraderie and lively sailing rivalries; and after 125 years still in the same building and still sailing on the same race courses. Beautifully written and lavishly illustrated, this book is a handsome treasure, worthy of its subject.